When these rescuers heard the sounds of distressed horses, they took matters into their own hands! A group of rescuers set out to make a difference in the wake of catastrophic flooding. Photo courtesy of Animalkind. Hurricane Florence may not have been the most recent destructive storm to hit the United States, but horses are still reeling from the impact that Florence made, and Hurricane Michael has only made matters more complicated. With all of the bad news, it’s important to remember that there’s still positive stories out there! 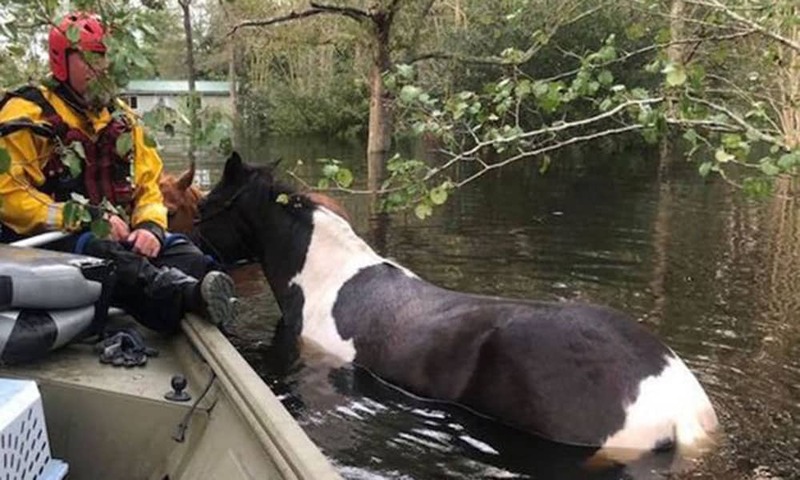 One such story is about a group of rescuers who saved two trapped horses, among many other animals, from rising flood waters in the aftermath of Hurricane Florence. The owner of the two horses had been airlifted to a hospital due to an emergency, so Krissie Newman, the founder of Rescue Ranch, took matters into her hands and, with her team, performed a daring rescue to save the horses. Watch the heartwrenching video below. The world needs more people like these brave rescuers!